There are plenty of companies making quality golf shoes in today’s market, but ECCO just might be doing it as well as anyone. 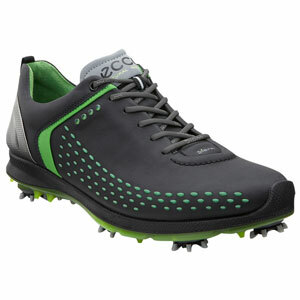 The ECCO brand has long held the respect of many golfers for their durable, comfortable, and great looking golf shoes. If you are a player who likes to be comfortable on the course while looking good at the same time, investing in a pair of ECCO’s is something you should strongly consider. Rounds of golf routinely take four hours to complete, if not longer. With that in mind, you want to be in comfortable shoes whether you are riding or walking the course. The ECCO Men’s BIOM G2 is designed with comfort in mind, including a number of features which help the shoe feel great around your foot. Also, the shoe is 20% lighter than the previous version of the BIOM, meaning that you will be carrying less weight around the course with you as the round wears on. The comfort of a shoe is a highly personal decision, so make sure to try on the BIOM G2 for yourself before deciding if it is the right option for you. Unless you play golf only under perfect conditions, your feet are bound to get wet from time to time. When you head out onto the course in the rain, it is a great benefit to have waterproof shoes to keep your feet as dry as possible throughout the round. The ECCO BIOM G2 shoes deliver on this point as well. With their HYDROMAX treatment, you can expect the water to stay out of your shoes even in lousy conditions. Not only is it uncomfortable to play golf with wet feet for hours on end, it can also affect your performance. By using the BIOM G2 to keep your feet dry you can improve both your enjoyment of the game and your scores at the same time. There is no question that the ECCO brand of golf shoes can come along with a hefty price tag – but quality rarely comes cheap. Beyond all of the practical features that they include, the BIOM G2 is also offered in six different colors so you can choose the look that is right for your own personal style. If you wish to own a high-quality pair of shoes that will allow your feet to be both dry and comfortable on the course, this is a pair that is certainly worthy of consideration.